This is a Watters Nyra gown, with white beaded lace over an almond underskirt. It is strapless with a sweetheart neckline, and a defined waist with an elegant pattern. The lace is beautiful, and the beading gives a subtle sparkle. It has a chapel length train and was altered to be able to be bustled (American style bustle). The dress was extremely comfortable and easy to move in. 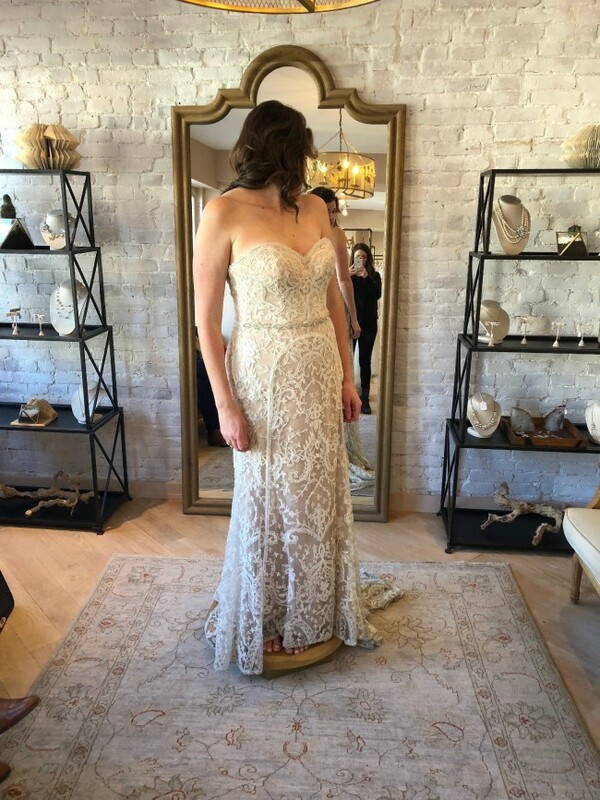 I loved wearing it and would love to pass it on! Dress was taken in at the waist and bust approx. half a size. I ordered the dress with extra length and had the hem shortened slightly. The dress now also has ribbons tied into the inner layers to allow it to be bustled. Once you send a message, Lynnie can invite you to purchase the dress.